Been sometime since watching Disney Pixar's UP. I wanted to write my afterthoughts of the movie but somehow it didn't happen so far. I read a blog post on UP and thought of sharing it here since I agree with most of the points. Adding to that, I did love Ellie more than Carl at the beginning. The Silent part was the best in the movie. The adventure of Carl seemed to have been forced on him than done with passion. And the villain didn't appeal much to me. I also thought something was not in place, probably because I wasn't expecting Muntz at that point of time on his legs and the talking dogs never enthused me. 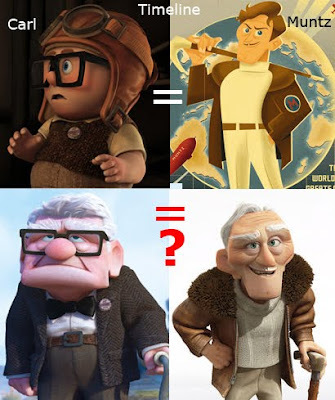 I felt the Pixar magic missing a bit in UP. It was definitely a let down!